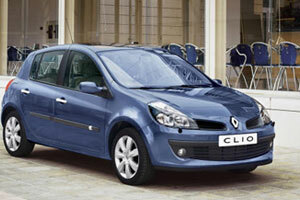 Of all the Renault Clio models the most popular is the cheap renault clio 1.4 16v Dynamique. When this car was launched there was some surprise regarding its size. It is significantly larger than the Mark II Clio and is approaching the size of the Renault Megane. The larger size means more comport for the car’s occupants though maked manoeuvring and parking a little more challenging. There is also additional boot space especially with the front seats folded down which adds to the practicality of an already very practical car. When driving this car for the first time many people consider the steering to be too light with insufficient feel. This improves the ease of parking and manoeuvring in tight spaces, but positioning it on the road at speed can be a little unnerving until you get used to it. The 1.4 has a very useful 99 bhp and although it is hardly a hot hatchback it will reach 62 mph from rest in just 11.5 seconds and it has a top speed of 109 mph. For a car in its class and price range these are quite acceptable if not startling. Overall the ride quality is excellent. The car is very comfortable and it has vey good sound insulation. Motorway driving is a pleasure and it handles very well on windy roads (once you get used to the steering). The build quality is very high both outside and in. The driving position is very comfortable and everything falls neatly to hand. Visibility is very good apart from the fact that there is a little too much obstruction by the body pillars. The safety features are also good. The car has a five star EuroNCAP rating and safety features include anti-lock brakes, electronic stability control, along with six air bags. Overall the Renault Clio 1.4 16v Dynamique is an excellent buy and a lot of car for the money. It makes an excellent family car and is very versatile with relatively low running costs.